The Global Crisis led to a sharp contraction in both Eurozone and US real activity, and was followed by a long-lasting slump. However, the post-crisis adjustment in the Eurozone and the US shows striking differences. In particular, the Eurozone slump has been markedly more protracted. There is a heated debate about the causes of these developments. Understanding these causes is essential for an effective policy response to the post-crisis slump. Some commentators argue that the protracted Eurozone slump reflects weak aggregate demand, driven inter alia by restrictive fiscal policy (‘austerity’) (e.g. IMF 2012, De Grauwe 2014, Stiglitz 2015). These commentators mainly advocate policy measures that boost aggregate demand. Other analysts stress that rigidities in Eurozone product and labour markets may have hampered the rebound of the Eurozone economy by slowing down sectoral redeployment and the adoption of new technologies (e.g. Fernald 2015). That analysis suggests that supply-side policies (e.g. structural reforms) would be appropriate to overcome the slump. Several commentators have also suggested that post-crisis deleveraging pressures and financial constraints have contributed to the persistent slump, especially in the Eurozone (e.g. Rogoff 2015). The supply of credit to the private sector was disrupted more persistently in the Eurozone than in the US, due to the continuing poorer health of Eurozone banks (OECD 2014). Eurozone banks rebuilt their capital much more gradually than US banks after the crisis; in addition, Eurozone bank balance sheets were weakened by the sovereign debt crisis that erupted in 2010-11 (Acharya et al. 2015, Kalemli-Özcan et al. 2015). We provide a slightly more detailed overview of the divergent post-crisis trajectories of the Eurozone and US economies to shed light on possible drivers of the slump. We then discuss our recent work that analyses the post-crisis slump using a state-of-the-art empirical model that allows disentangling and quantifying the key shocks and transmission channels that have been debated in the academic and policy literature (Kollmann et al. 2016). Eurozone and US per capita GDP grew at about the same rate before the 2008-09 Great Recession. Both economies experienced roughly the same (relative) contraction, -5%, in 2008-09, and then began to recover at roughly the same rate. However, the Eurozone recovery was short-lived. In 2010-11, the sovereign debt crisis erupted in Eurozone periphery countries, and the trajectories of Eurozone and US per capita GDP began to diverge – the Eurozone experienced a recession in 2011-13, while US output growth returned to pre-crisis rates (see Panel a of Figure 1). Eurozone and US per capita real GDP only recovered to pre-crisis levels in 2016 and 2014, respectively, and remain noticeably below pre-crisis trends, as of this writing. Private investment contracted less (as a share of GDP) in the Eurozone than in the US during the 2008-09 crisis, but in the aftermath of the crisis the Eurozone investment share continued to trend down, while the US investment share began to recover in 2011 (Panel b of Figure 1). The post-crisis Eurozone–US divergence is also apparent in total factor productivity (TFP), a key determinant of an economy’s production capacity. 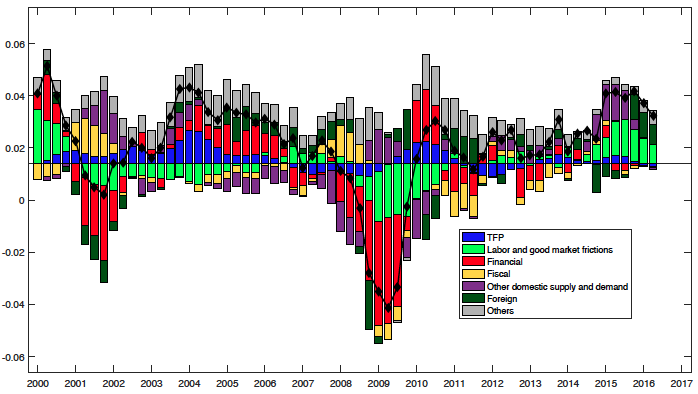 Eurozone TFP fell during the Great Recession, and has since then stagnated at a level below its pre-crisis peak. By contrast, US TFP showed zero growth during the Great Recession, and then started to grow again (see Panel c of Figure 1). Also, post-crisis inflation has been lower in the Eurozone than in the US. Banking/financial variables too indicate a marked divergence between the Eurozone and the US in the aftermath of the Great Recession. The health of both the Eurozone and US banking systems was damaged by the 2008-09 financial crisis. However, the state of the Eurozone banking system continued to deteriorate after 2009, while the health of the US banking system improved steadily. Note, for example, that the Global Crisis triggered a sizeable increase in Eurozone and US non-performing loan (NPL) rates (defined as non-performing bank loans divided by outstanding loans) (see Panel d of Figure 1). The Eurozone NPL rate continued to trend upward during 2009-14, while the US NPL rate fell steadily. As we document in Kollmann et al. (2016), credit supply continued to tighten in the Eurozone after 2009, while credit standards loosened in the US. Notes: Eurozone variables: continuous lines; US variables: dashed lines. Source: Kollmann et al. (2016). So far, the debate on the causes of the post-crisis slump has often been polemical, with little use of evidence-based quantitative models. Our research in Kollmann et al. (2016) sheds light on the main hypotheses that have been discussed in the literature (see above), by developing a structural macroeconomic model of a three-region world derived from coherent microeconomic principles. The model is estimated with quarterly data for the Eurozone, the US, and an aggregate of the rest-of-the-world, for the period 1999Q1-2016Q2 (the extension until 2016Q2 referred to below is an update of Kollmann et al. 2016). To address the range of views about the post-crisis slump, the model assumes a rich set of demand and supply shocks in goods, labour, and asset markets, and it allows for nominal and real rigidities and financial frictions. The use of an estimated economic model allows us to infer the shocks that have driven the divergent Eurozone and US adjustment paths – and, hence, to determine what shocks and transmission mechanisms mattered most during the financial crisis and its aftermath. Figures 2a and 2b summarise the key results. 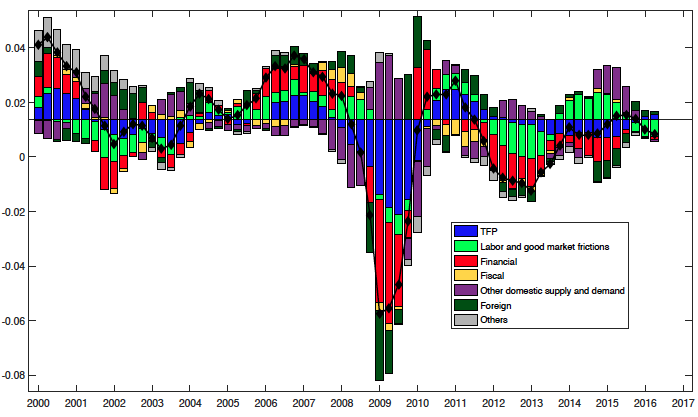 The coloured bars show the contributions of key shocks to historical year-on-year growth rates (annualised) of real GDP in the Eurozone and in the US (solid lines with rhombs show the data). Bars above the solid horizontal line represent positive shock contributions, while bars below the solid horizontal line show negative shock contributions. The slow post-crisis recoveries in the Eurozone and the US have both common and idiosyncratic components. An important common feature for the Eurozone and the US was a strong rise in risk premia on production capital investment (investment wedges) during the 2008-09 recession (see negative contribution of "Financial" shocks to GDP growth in Figures 2a and 2b), which put an end to the pre-crisis investment boom. A second common factor was the negative contribution of falling export demand during the same period ("Foreign" shocks). The persistent Eurozone slump after 2008-09 (a double-dip recession) reflects a combination of adverse supply and demand shocks, in particular negative shocks to TFP growth, and adverse shocks to capital investment risk premia linked to the poor health of the Eurozone banking system. The negative contribution of adverse Eurozone financial shocks to real GDP growth continued until 2015, but disappears in the most recent quarters. A model-based decomposition of the European Commission output forecast for 2017 (European Commission 2016) suggests continued moderation of financial conditions for the Eurozone. In Kollmann et al. (2016), we show that the estimated capital investment risk premia correlate strongly with empirical measures of credit tightness. In addition, the model suggests that rising price and wage mark-ups ("Labour and goods market frictions") depressed Eurozone growth in 2012-13. The empirical analysis suggests that (discretionary) fiscal policy had some impact, especially when accounting for the lower-bound constraint on monetary policy (see the online appendix to Kollmann et al. 2016). Fiscal policy was stabilising during the 2008-09 recession and contractionary (austerity) in subsequent years, but it was not a major factor delaying the recovery in the Eurozone. The faster post-crisis rebound of the US economy largely reflects a steady fall in capital investment risk premia, linked to the faster improvement in the health of the US financial system. In other terms, adverse financial shocks were less persistent in the US than in the Eurozone. Furthermore, post-crisis TFP growth fell markedly less in the US than in the Eurozone. In the aftermath of the crisis, US aggregate activity also benefited from more resilient private consumption demand, consistent with faster household deleveraging in the US (compared to the Eurozone). However, the estimates also identify important factors that slowed down the recovery of the US economy. In particular, US price mark-ups rose during the post-crisis period – i.e. goods prices responded only moderately to falling demand – which had a negative influence on US output. The post-2009 slump in the Eurozone mainly reflects a combination of adverse aggregate demand and supply shocks, in particular lower productivity growth, and persistent adverse shocks to capital investment, linked to the poor health of the Eurozone financial system. Mono-causal explanations of the persistent slump are thus insufficient. Adverse financial shocks were less persistent for the US. Authors’ note: The views expressed in this paper are those of the authors and should not be attributed to the European Commission. Acharya, V, I Drechsel and P Schnabl (2015), “A Pyrrhic Victory - Bank Bailouts and Sovereign Credit Risk”, Journal of Finance 69, 2689-2739. De Grauwe, P (2014), Stop Structural Reforms, Start Public Investments. European Commission (2016), “European Economic Forecast Autumn 2016”, European Economy Institutional Paper 38. Fernald, J (2015), “The Pre-Global-Financial-Crisis Slowdown in Productivity”, Working Paper. International Monetary Fund (2012), World Economic Outlook (October). Kalemli-Özcan, S, L Laeven and D Moreno (2014), “Debt Overhang in Europe: Evidence from Firm-Bank-Sovereign Linkages”, Working Paper, University of Maryland. Kollmann, R, B Pataracchia, R Raciborski, M Ratto, W Röger and L Vogel (2016), “The Post-Crisis Slump in the Euro Area and the US: Evidence from an Estimated Three-Region DSGE Model”, European Economic Review 88, 21-41. OECD (2014), Economic Surveys: Euro Area. Rogoff, K (2015), “Debt Supercycle, Not Secular Stagnation”, VoxEU.org, April. Stiglitz, J (2015), “Les dégâts induits par la crise sont durables”, In: Le Soir (Bruxelles), 2 September, pp.14-15.